When it comes to living healthy, perfect is the enemy of the good. It’s more important to get active, stay active, set goals, and try your best to reach them. Women draw inspiration from peers and other women who look fit and follow a healthy regime, and that extends to the types of diet and fitness products and activities that women have tried in order to live healthy. As part of the POPSUGAR Insights 2014 Healthy Living Report, we asked women to identify the healthy lifestyle products and activities they’ve tried to understand what’s hot, what’s not, and what works for women. Food is an important part of a healthy lifestyle, and making good choices is important. Three out of the top five responses to what women have tried were food related, including taking a vitamin supplement (75%), purchasing a healthy food product (73%) or purchasing an organic food product (57%). The Web continues to be a driving force in helping women learn more about how to live a healthy lifestyle. 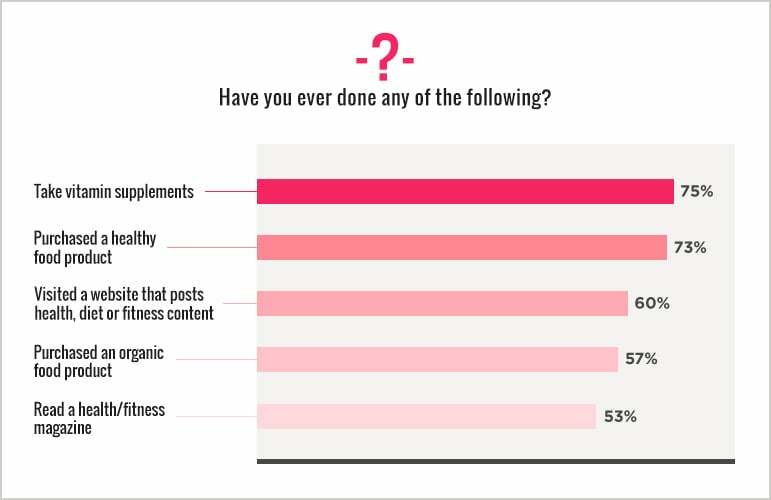 Overall, 60% of women have visited a website that posts health, diet, or fitness content, and 44% have visited a blog that posts health, diet, or fitness content. Also, 29% have gone on a diet that they read about online, and 22% have subscribed to a health newsletter. In terms of exercise and other activities, 48% of women have tried yoga or Pilates, 30% have tried a popular diet, 23% have begun a cleanse, and 19% have gone to a personal trainer. Brands should take note that three out of the top five responses are product related and the remaining two are media related, meaning that women are open to trying healthy living products and using the web and magazines to keep up to date with the latest trends in healthy living.